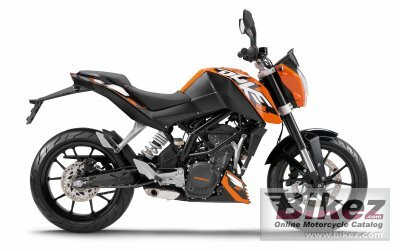 2015 KTM 125 Duke. Picture credits - KTM. Submit more pictures. Since 2013, the 125 Duke has settled a new safety standard with the first ABS in the 125 cc class. A feature that makes the pleasure of the impressive Duke dynamics even safer for 16-year-olds and gives the finishing touch too what are unique chassis qualities in this segment. On the new KTM 125 Duke, the ABS � from Bosch as usual with KTM � monitors the function of the powerful brake system with a radially mounted four-piston calliper biting the 300mm diameter front disc - fun without risk, developed in close cooperation with the specialists from Bosch and Brembo. And for the stunt riders among us: the ABS is naturally disengageable. Driveline: 5/8 �x �1/4 � (520) O Ring. Primary drive: 22:72. Ask questions Join the 15 KTM 125 Duke discussion group or the general KTM discussion group. Bikez.com has a discussion group for every motorcycle. Here you may find answers to common questions about the model. If you do not find what you are looking for, you can ask questions. Try out the 2015 KTM 125 Duke discussion forum. You can sign up for e-mail notifications when other users answer you. If you have information about any technical issue related to this motorcycle, please leave a comment for other riders.